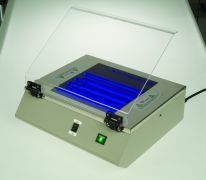 These UV Transilluminators are multitasking workstations which offer an ultra-violet source for the analysis of fluorescently stained DNA, RNA, and Protein electrophoresis gels. 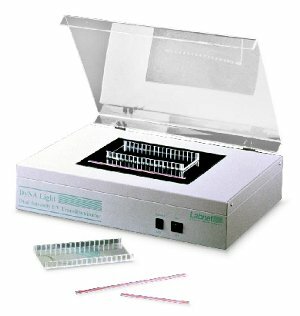 These also offer space to place tube racks, cutting tools or waste agarose gel, ideal when there is a need to cut bands. These new generation UV transilluminators include a specially designed safety UV leakage indicator which changes colour when UV light is detected. Each model includes a High Low intensity switch. A new and high quality starter ensures that the UV tubes energise immediately and without flickering. This feature extends the life of the tubes. Two Dual wavelength models offer added flexibility and convenience. With its dual intensity light source, the DyNA Light UV Transilluminator is suitable for both analytical and preparative work. The large viewing surface accom0modates all popular gel sizes. The intensity of the DyNA Lights 302 nm UV light source can be adjusted to two levels, normal and low, at the touch of a button. The low setting provides a 20% reduction in intensity to minimize damage to nucleic acids during longer exposures. Full intensity produces clear and bright illumination for documentation work. Users are protected by a hinged, transparent shield of UV blocking acrylic that covers the top surface of the transilluminator. The cover can be raised to the proper angle for viewing samples and lowered when not in use to protect the viewing surface from dust and scratches. A built-in filter guard reduces solarization and protects the UV filter, extending its service life up to 5000 hours.